This restaurant in Japan has a goldfish tank in the deep fryer. 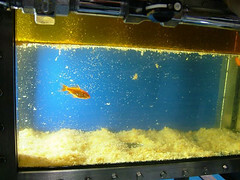 Because oil floats on water, despite the massive heat (163 degrees Celsius) the goldfish simply stay away from the surface and all is well. They eat the crumbs of croquettes and other fried foods that fall to the bottom, and can live in there for 5-10 years as they happily clean away, ignorant to the fact that certain death awaits any potential escapees. Staggering the possibilities this opens up. . .